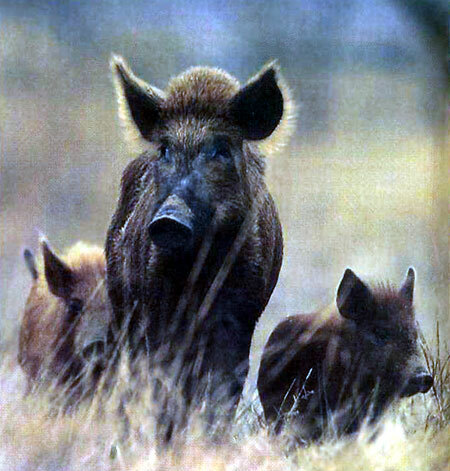 Wild boars inhabit most of Azerbaijan. They can live in very different environments including snowy and sub-tropic forests and dry areas. 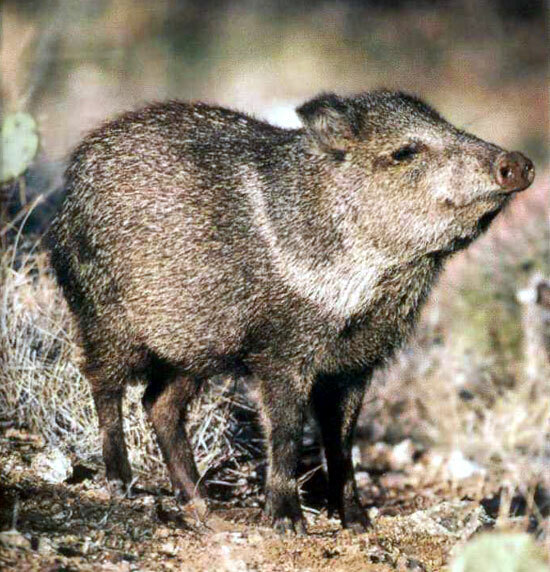 The vwild boar is a strong animal with fast moves and easily carries its heavy, but strong body on firm and relatively short legs. Boars always keep in small herds consisting of males, females and piglets. Only old bills live alone, and hunters call them accordingly, "singles". A boar rather badly sees with its small eyes, so smell and hearing play very important roles in its life. It is not occasional that the first move of a boar suspecting danger is to move the nose up and strongly inhale simultaneously pointing up the ears. Wild boars are mostly night animals spending daytime for rest in places the densest and hardest to reach. However they can pasture even in daytime where the are not troubled: Wild boars, as well as domestic pigs, are omnivorous. If prints of front hoofs are bigger than 5 cm, the animal is worth a hunter's interest because it weighs about 110 kilos, and each additional 6 mm of a hoof diameter means about 45 kilos extra. 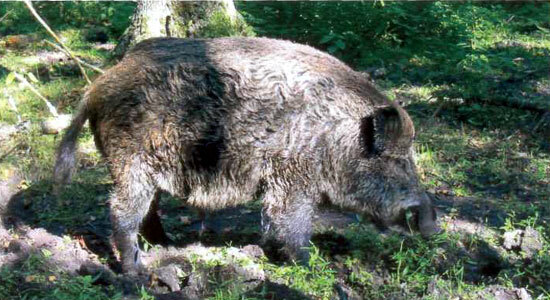 To shoot a good boar especially in a thick forest, one has to follow the traces, which can often be found near a river or in other places where boars have an opportunity to dig under roots. 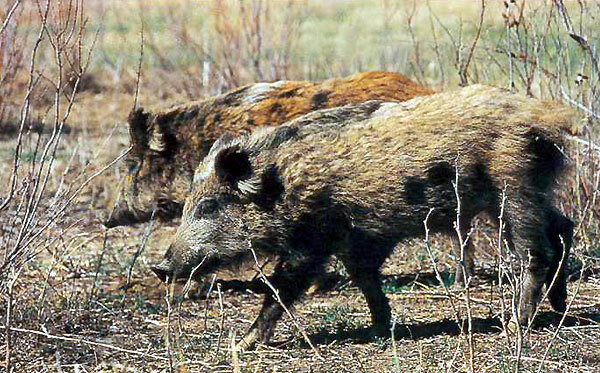 Seashore canes are the boar's main habitat in the Caspian area; they provide it with asylum and food. In summer, the water going offshore, boars deepen into flood and rarely appear in open steppes. In late July, steppe almost completely dries out in hot sunshine, and grass becomes uneatable. In contrast, canes start growing Intensively at this time. Caucasian highland forests can't be imagined without boars either. They prefer beech-and-hornbeam or oak forests with hazel or yellow-rhododendron underwood. In summer, they populate oak and chestnut groves and high-grass glades. Hunting boars is the most exciting when with hounds similar to that for bears. Hounds are brought where a boar's traces can be. Hounds find a fresh one and follow by it. They chase the boar up as a bear, but it may continue several days. However, approaching hunt is the most common to fetch a boar. The animals are the most active in sunrise and twilight, when they graze in open places. As for a deer, hunters must approach slowly from a leeward side because boars feel smells and hear perfectly. It is necessary to often stop for watching and hearing. When tracing, long hours of breaking through highland bush are sometimes needed. Special care and attention are required near grazing places and when tracing in a thick underwood or high grass because a boar may lie in such places. A lucky hunter may see a boar still in the morning when it eats and digs under roots, which is the only chance to catch it busy when human presence may be unfelt. Indicators of boars' presence such as traces, defecation, dirt pools, and soil dug out in search of tubers and roots require special attention. One had better search such places in advance of hunt. It makes sense to check reservoirs where boars come for drinking water. Wherever a boar lives, it has a habit to arrange a bed from branches, brushwood, grass, leaves and different wreckage. In highland areas, such beds are usually made on ridges, and they can be found under trees if in open spaces. Still fresh, grass and leaves are easily seen, but it gets harder after a while. A boar creeps under this plant layer; if worried, it noisily jumps up and usually rushes down the slope. Therefore, a careful hunter should approach to a known bed from the hill top or down the slope. Closer to the bed, the boar's trace gets zigzag, and an aware hunter must walk very carefully. The boar attacks fast ad strongly, so a double-barreled gun or a magazine rifle of caliber 10 or 12 charged with big buck-shot makes sense when tracing. The boar has 20-cm-long fangs. On attack, it never steps back even from a hunter. In some cases, hunters have had to hide behind the nearest trees for protection against the animal. Whether the boar is naturally aggressive or tries to escape as soon as possible in case of danger is permanently discussed. However, one had better not check which is right, but try to leave at once if meeting a boar in the forest. The hunt season is through September to March.